New Book: Elizabeth Grossman and the Green Chemistry Revolution. Toxic chemicals are seemingly ubiquitous. Since everything on Earth is Hyperinterconnected, chemicals intended for one use, in one product, can easily find their way into other things, like soil, air, water and bodies. Scientists have been trying to determine where toxic chemicals are ending up, and the results are shocking: Dangerous chemicals are even being found in the blood of newborn babies. These alarming facts are what investigative journalist Elizabeth Grossman came across while researching her latest book. She says that there is a solution: green chemistry. Green chemists are redesigning the future and learning from nature to create new, non-harming chemicals and products. Without green chemistry will be entering into a very dangerous world. Many of the chemicals she was chasing are endocrine disruptors, which have the ability to change our genetic makeup. They can mess with reproduction and lead to an increase in fat cells, which leads to higher rates of diabetes and slower metabolism. They have been shown to reduce sperm count and also mess with neurological function. Grossman quotes Theo Colburne as saying that without green chemistry the future is going to be "fat, stupid and impotent. But, it's not so easy to convince some industries to become green, as many of the harmful chemicals that are being used have been on the market since the 1930s. The research has been done and the products made. Many companies, too entrenched in the old ways, do not see the benefit of redesigning their entire line. Without strong political will and support to discontinue dangerous chemical use, companies stuck in their ways will continue to use harmful methods, and chemicals will continue to find their way into every aspect of our ecosystem. For those who are new to the toxic chemical debate, Chasing Molecules provides a strong argument for the implementation of green chemistry. For those who are aware and motivated, it provides a hopeful look at the benign design revolution already taking place. It's gonna-be cheaper, more efficient, ecologically cleaner and safer to fly in the future. I for one am over-the-moon with the pace of the R&D in Aeronautical Hydrogen Fuel Cell Technology. Commercial jet engines that run off water, use anode/cathode molcular convertion systems to split the H2O molecule, then use the hydrogen as power-fuel, whilst spitting out the Oxygen into the atmosphere. And too boot: fly through the clouds and refuel for free! There's even breakthrough work-in-progress using sea water. Much work to do, but the push-through is happening. Read the post below: It's happening now. This Tuesday, the Antares DLR-H2 took off at Hamburg Airport in Germany using only power from Hydrogen Fuel Cells, a feat that its builders say is a first for a piloted aircraft. The motorglider, built at the German Aerospace Center, flies with zero carbon-dioxide emissions and is much quieter than similar aircraft. " This motorglider achieves new quality standards in the field of high-efficiency, zero-emission energy conversion and clearly demonstrates the progress that has been made in fuel-cell technology. 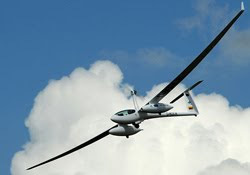 The DLR-H2 is based on the Antares 20E motorglider, and has a wingspan of 66 feet. With its fuel-cell propulsion system, the aircraft can stay aloft for five hours and reach speeds of about 105 mph. With the successful first flight, they have verified the feasibility of fuel-cell-powered flight and their next steps will focus on improving efficiency levels and on extending the service life of these systems. At this stage, they have only tapped into a fraction of the performance capabilities of this technology for aerospace applications. The Antares DLR-H2 will help make much greater use of these areas of potential. To accommodate the fuel cell and its hydrogen supply, two external pods were attached under the aircraft's wings, which were reinforced to carry the load. 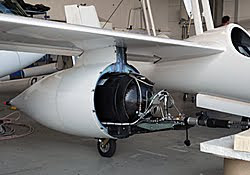 The total efficiency of the drive system from tank to powertrain, including the propeller, is about 44 percent, making it about twice as efficient as conventional propulsion technologies based on combustion processes, according to the Aerospace Center. For more details about the project, click here to read the Aerospace Center's lengthy news release. Or watch a short video on the Antraes DLR-H2 Maiden flight! 'The real answer to this timeworn question of course is one. It took just one Gandhi to set off a wave of enlightenment across the planet; and one maverick scientist by the name of Nikola Tesla to invent the electric age, prompting us to screw in a never ending supply of lightbulbs. On the other hand, the will of just one zealous despot, Adolf , almost succeeded in throwing us back into the dark ages. It only takes one mutant cell to change the course of human evolution. And every time one internet user shares a good idea, it may exponentially reach the minds of two, four, or perhaps a million people who come across it on their non-linear path. We owe the rapid rise of human civilization (and our ability to screw in a light bulb) to a simple evolutionary modification of our digital extremities known as the opposable thumb. Click here to read full piece (press 'read on' on site). Or read about how and what the SpaceCollective is all about. Hyperart That Vibrates Off Radical Evolution. A phrase from the book Radical Evolution has been linked to art in an intriguing way by Los Angeles artist Folkert Gorter. 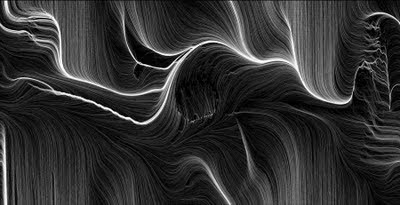 In my experience the notion that producing art in an environment without barriers between ideas and their 'physical' incarnation is one of the most interesting activities to be engaged in. Hyperart: the multidimensional interconnection of artistic ideas. Emm!! Think all your gadgets are dreamt up across the pond or in secret Far East bunkers owned by the world’s biggest tech titans? Britain is at the forefront when it comes to bleeding edge gadgetry, whether it’s the latest shiny must-have from Apple, or a motor that’s all set to break the land speed record. It’s easy to forget British boffins are behind some of the world’s greatest gadgets. One omy favrite inventors is Richard Palmer, founder D3O In Hove, Brighton UK. D3O is about to revolutionise gadgets. You might not know its name, but it’s one of the world’s first smart materials, and it was invented by a Brit! Chemical engineer Richard Palmer set up his own business to create the substance, which acts like silly putty in your hands, but stiffens up to absorb shocks and bumps whenever it’s hit. It’s a silicon polymer that has the look and feel of playdoh, and is already in laptop and iPod cases from Tech 21, saving your precious tech from taking a battering. Palmer also says it could go into body armour too. Think futuristic football shin pads that mould to your legs but harden up when you’re hit by a crunching tackle. Smart materials are the future, and Palmer proves you needn’t be a mega multinational to make your mark. View his companies work, click here. Or click Wiki-3do here to see list of achivments!